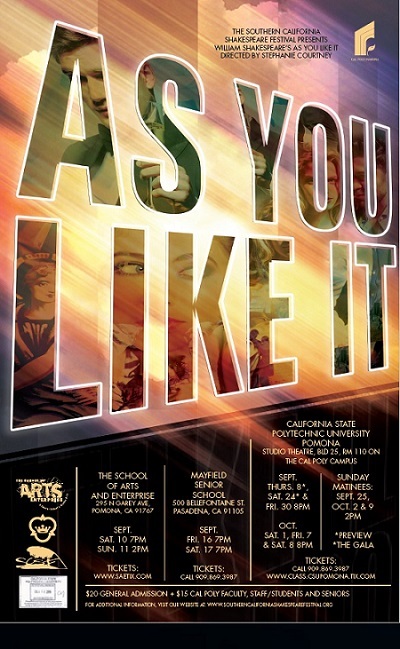 Director Stephanie Courtney puts a fresh spin on Shakespeare’s As You Like It for the Southern California Shakespeare Festival beginning September 8. French Court now becomes a private estate and the Forest of Arden a desert that surrounds it, where sibling rivalry boils over into treachery. Those banished by jealous relatives to the treacherous wasteland must discover a new way of life, explore new identities, and find the freedom to pursue love and a utopian existence among the quirky and charming native inhabitants of a strange and wonderful landscape. The cast includes Natalie Roy Wilson as Rosalind, Sam Robinson as Jacques, Marissa Pitts as Celia, Andrew Wilson as Touchstone, and Linda Bisesti as Adam, with students and alumni from the Department of Theatre and New Dance at Cal Poly Pomona completing the ensemble. Festival personnel also includes: Linda Bisesti (festival artistic director), Gaby Robles (set design and costume design), Clayton Fournival (lighting design), Gerard Marquez (sound design), Jackie Gill (properties), Kristy Priest (stage manager), and Joanna Lopez & Bianca Leanos (assistant stage managers). Marie Maslowski is the festival production manager and box office coordinator along with Spencer Saccoman/assistant festival production manager for SCSF. Stephanie Courtney is a graduate of the prestigious Trinity Rep program with an M.F.A in Directing, and a B.A. in Theatre from CSULB. She is currently Producer/Artistic Director at Fortune’s Fool Productions in Dublin, Ireland and teaches at PCPA. A gala reception follows the Saturday, September 24th performance. Special added performances will take place Saturday Sept. 10 at 7pm. and Sunday Sept. 11 at 2pm at The School of Arts and Enterprise, 295 N. Garey Ave., Pomona, CA 91767. Tickets are available at www.saetix.com, and Friday, Sept. 16 & 17 at 7pm at the Mayfield Senior School, 500 Bellefontaine Street, Pasadena, CA 91105.